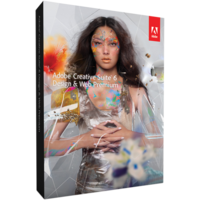 Adobe Creative Suite 6 Design & Web Premium is a toolkit from Adobe developed to combine specific features of design and web development to meet the needs of web designers and online application creators. The software ensures stable creation of high quality graphics and compelling images which can be easily encoded right in the web code to be properly rendered by browser engines. The software offers all necessary tools for crafting high quality pages for commercial printing. The Adobe Creative Suite 6 Design & Web Premium release offers you to code CS3 and HTML projects right in this single workspace providing all necessary tools at hand. From this release the product supports cross platform coding – the software has got new tools ensuring proper coding and designing for various displays of smartphones and tablets. Another improvement of the pack is advanced speed and precision. The Adobe Creative Suite 6 Design & Web Premium offers creative freedom and precise control of your projects during web publishing or printing. The upgraded software engine ensures ultimate speed of creation, editing and publishing of complex graphic projects which are known traditionally not only to be slow on their own, but to slow overall performance of your computer. From this release the problem is resolved. iOS design – the Adobe Creative Suite 6 Design & Web Premium version offers necessary tools to design applications, graphics, websites for iOS devices without need to learn new tools and design applications. Content Aware features – use smart features to get exact patches to ensure even colors and lines of images you create or edit. Content Aware Patch will use the most appropriate piece of content form image environment to use on a necessary image area. Image Trace will help you to render raster images in simply editable vector ones for fast changing and fitting up to your needs. The new tracing engine of the software ensures cleaner lines, more accurate fitting and simpler design without usage of multiple controls to achieve a desired effect. New Crop tools – the upgraded tools for image cropping ensure more precise and accurate results. The tools are now hardware accelerated. Advanced acceleration allows you to see all the changes live and estimate what to change next or whether to save the changes or not. Video editing – add video content to your web projects, edit videos as you need to meet the requirements of your projects, make clips and use transitions. 3D objects – add amazing 3D graphics to your projects and make them look more realistic adding shadows, making them look as cartoons or sketches or get them animated. PDF forms in your design works – you can create all necessary forms for your PDF projects right in the working environment and then export a ready project which does not require any editing in PDF file. Adobe Creative Suite 6 Design & Web Premium is an ultimate tool for designers creating for both (print and web) industries. It accumulates all necessary features enabling you to create designs for various platforms in a single working environment. Good prices and conditions for the purchase of software, fast delivery, friendly and correct staff. I have made the purchase here twice, and I am satisfied twice. Thank you for the quick response to all questions and suggestions.